This year New Victoria CC embarked on their fourth international tour to Northern Europe and visited the Baltic state of Lithuania to play two club sides as well as their usual international game. 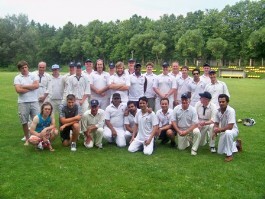 The first game on the 12 July was against Vilnius Cricket Club. New Vic won the toss and elected to bat and in their 30 overs scored a respectable 148 being all out on the final ball of the innings when Craig Williams was run out without facing a ball. Top score came from Sam O'Sullivan with 25 and several other players chipped in with double figure scores, extras making up the difference. Shaun Cragg took a wicket with his third ball and in the next over the Vilnius captain was given 'run out' but in an act of great sportsmanship captain Barry Mills called him back. Unfortunately, this same batsmen finished the game with a 6 off Joe Sawbridge in the last over ending on 61 not out. With the opposition 9 wickets down and being in the last over, that evening in the bar questions were being asked over the generosity of calling the player back. It was generally agreed that it was the correct thing to do at the time, but not to be repeated. The other harsh decision by the captain that day was the fact he made his dad, Brian, field in the hot sun all 30 overs while he went down to fine leg in the shade. The second game the following day which was played in 38 degree heat was also a close affair. New Victoria again batted first getting to 171 for 8 off the 30 overs. Owen Jaimeson top scored with 31, Graham Sweeney made 26 and again several others chipped in including Chairman Peter Hames who hit 2 boundaries off the final over. Extras also gave a healthy addition to the score due to the indifferent bounce off the flexi-wicket. The local side were never really in it until near the end when they were 9 wkts down, 8 overs left and still 55 runs behind. The captain for the day, Steve Saunderson, decided to give some others a bowl and this is where it started to go wrong. The game ended when Steve decided to give himself a bowl and found it difficult to land the ball on the wicket but after conceding 26 runs and still a couple of balls to go the batsmen missed one and was stumped easily. Although well out, the square leg umpire had already gone off so the batsmen was given out by Paul Doran, New Vics fielder at point. 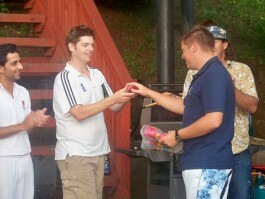 The decision was accepted by the batsmen and New Vic won by 2 runs. The third and last game was the International fixture and this proved to be a much tougher game. The opposition were made up from the best of the two local club sides and a couple of others who had not previously been available. It was a quiet and sombre mood on the way to the game, possibly due to the four previous nights of touring the local nightspots. This was captured best by John Hames who photographed his nephew Steven Hames throwing up in the trees, we think in an attempt to win the long throw of the tour award although this in dispute. Club Captain Dale Johnson was in charge and it was wildly welcomed when he also won the toss and decided to bat A familiar pattern emerged and New Victoria made 151-8 off their 30 overs, again no big scores but everybody getting a few (except for the captain who got his second duck of the tour). Martin Doran top scored but again extras gave a significant amount of runs to New Vic. Lithuania started steadily and were going well at 59-1 after 11 overs.Shaun Cragg changed all that with probably the best Hat-trick I have ever seen. He clean bowled the strong middle order and finishing with figures of 4-27 off his 6 overs. Lithuania never recovered and soon Colin Fenny was on a hat trick but just missed out. Joe Sawbridge is on a Hat-trick next time out after getting the last two wickets in two balls including the opener who scored 61. Lithuania were all out for 130 making it a win for New Victoria by 21 runs. This has given them an international record of 6 wins out of 6 games which apparently could move them up from their 84th in the unofficial world rankings - which is not bad for a team that is probably 200th in Lancashire. Finally thanks must be given to our hosts for making us most welcome and looking after us including Bar-B-Q's after each game with plenty of the local brew. A revisit may well happen in years to come because after the last game the Lithuania team burnt a bat and put some ashes into a small urn insisting we come back in the future and give them a chance to win it back.